So, I spent a long recent weekend in Florida heading south from Atlanta where my money-job employer had its annual national sales meeting. A Wednesday late afternoon hop to Orlando, then a quick drive north to Ocala via the turnpike and I-75. My mom and husband Chris have recently settled there after more than a decade in the lake country east of Gainesville, and two days with them was just shy of perfect. I was greeted with the Swiss steak and mashed potatoes dinner that my brothers and I happily abandoned friends and fun for one night a week since we were knee-high. And in the following 40 hours the three of us filled each other’s ears and eager curiosities with a year’s worth of life events. Earlier phone calls and emails had barely scratched the surface; only that face-to-face time thoroughly satisfied my soul. 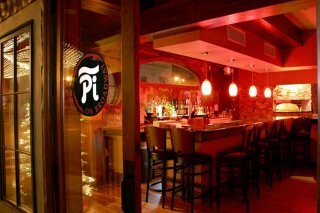 We ventured into the city, encountering several horses painted for the Horse Fever display eight years earlier — Ocala is thorough-bred country after all — and they’d also scouted out a source of outstanding microbrews to accompany lunch one day: Pi on Broadway. An afternoon visit to the Ocala Civic Theater was an unexpected highlight — my mom has volunteered there for 15+ years, working in the box office and scrapbook-cataloging 60 years of theater history. Thanks again to her cohorts there for treating her like family and providing her an artistic outlet and a place to wile away her Wednesdays. And a special thanks to Tim Dygart, their production manager and tech director, for the illustrative walk through the set work you’ve accomplished over the years. Awesome stuff. Friday afternoon I reversed course back to Orlando for a couple days with a couple of friends who in the land of acronymic labels would bear the tag BFFs. Nancy worked with Alison Lockwood at Harcourt Brace Jovanovich for ten years in the late 80’s and she spent the vast majority of her evenings and weekends hanging with Alison and her husband, Graeme. In the early 90’s, as Nancy and I navigated our two-year Seattle-Orlando romance, G & A encouraged us through the tough times, stamped me approved when the time came, sad-heartedly bid her adieu when she moved to be with me, then stood up for us when we eloped five years later, joining us in Banff and Lake Louise for our winter honeymoon. We get to see them almost once a year now with an occasional big rendezvous thrown in — Alaska and New Orleans being the highlights. They ran a deli named the Sandwich King for 15 years — Graeme’s Cuban is still the best I’ve ever wolfed down — and now he’s a wildly successful personal finance manager. And Alison writes. Oh my, how she writes. Right now she’s basking in the glow of successful first novel stardom. 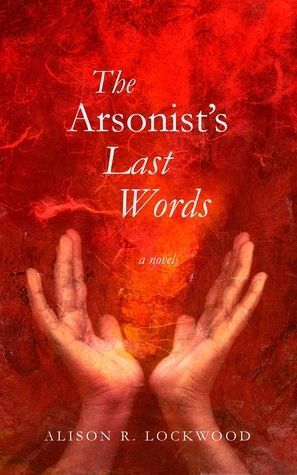 If you’ve not yet experienced the profound pleasure of The Arsonist’s Last Words, you’re missing out on something special. People praise my Brother’s Keeper, but my own authorcraft pales in comparison to Alison’s. She’s truly brilliant. So, we spent the weekend downing delicious craft beers, eating way too much food, including a flashback spectacular evening at Bosphorous, a Turkish delight in Winter Park. Esme, lavas, shepherd’s salad, kofte, kebaps, ayran, raki, and authentic Turkish coffee. I was transported back to Istanbul! We watched the Seahawks’ edge-of-seat joy-defeat at a favorite craftbeer place named TAPS, and then watched the emotion-churning new film The Impossible, a must see for anyone who loves cinema and life and hope and Naomi Watts. But the MOST satisfying component of my weekend occurred unexpectedly, when Alison hitched me along on her family’s Saturday breakfast gathering an hour plus away at Lake DeLeon outside of Deland. 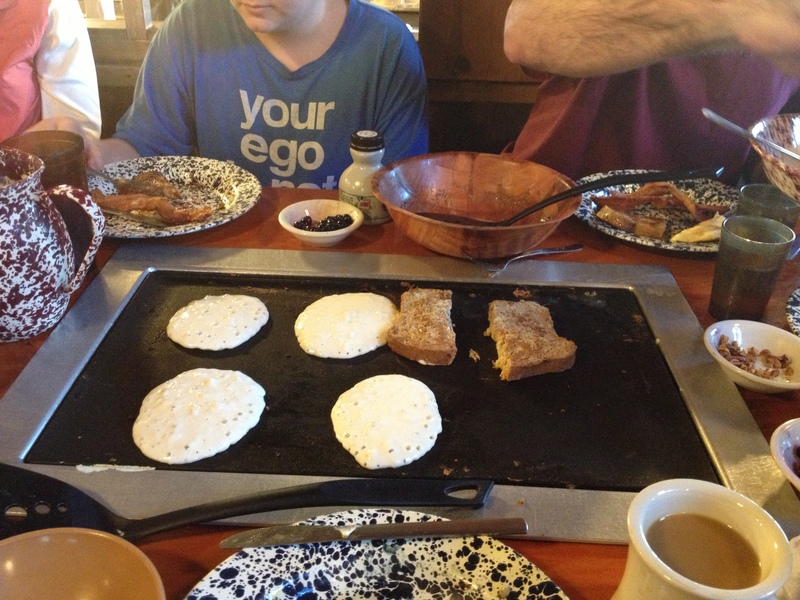 There’s a park there, and a natural lap pool, and pontoon boat tours on the Johns River, and a restaurant called the Old Spanish Sugar Mill that serves all-you-can-eat pancakes every weekend with lines out the door and griddles embedded in each table, so you can grill up your flapjacks yourself, along with bacon and eggs, if you want ’em, and more bacon, and blueberries and walnuts to toss in your pancake batter. And a whole lot of yums. And laughs. A down-home Hee Haw version of Benihana’s. Kinda sorta. In attendance were moi and G & A and A’s sister A with husband C and 15 year old daughter C and 13 year old son E and A’s dad and mom. I’ve known them all for a long time — C and E since birth — and spending a full morning with the whole clan was a joyous kick. After breakfast we explored the Hit and Miss Engine gathering at the park. Ahh, “hit and miss” you ask. Well, too many details to go into here, but think early century single cylinder engines with weighty flywheels. Lots of pops and whirrs and steam smoke everywhere. 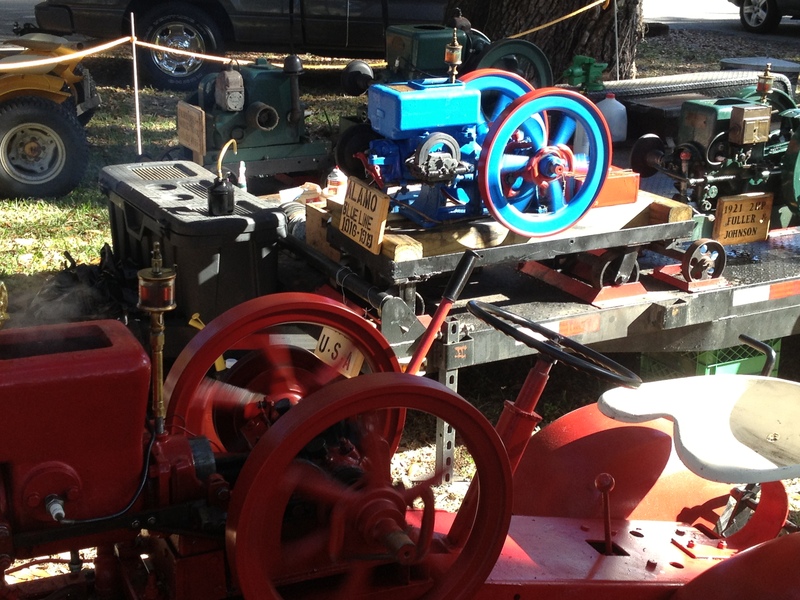 Early tractors used them, and many other early mechanical contraptions. Now there’s a cult following. Way cool stuff. Hit and Miss — now you know. 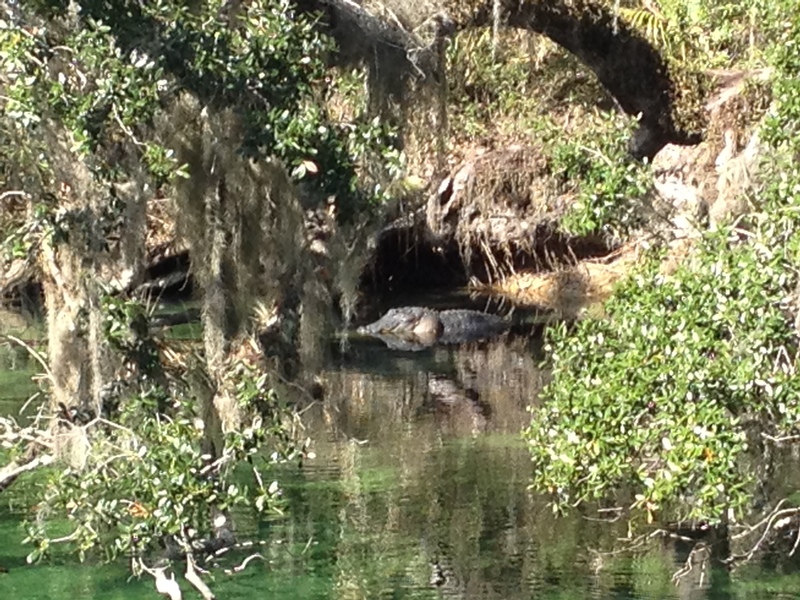 And then we drove a half hour to Blue Springs Park in pursuit of manatees. Every winter a couple hundred of these seacows settle into this narrow arm of the St. Johns River where the water from the Blue Spring keeps them all warm and toasty. Literally tons of these docile cow-like creatures gather here, but we didn’t really see more than a dozen. They were underwater and over yonder on the other side of the waterway. Like under the fallen tree trunks, over there in the shadows. By those turtles. Yeah, cool turtles sunbathing on rocks. And alongside those alligators. Yeah, humongous alligators with glittery yellow teeth peaking out of their jaws. And we saw schools of gars and tarpon and tilapia and other Florida river fauna. 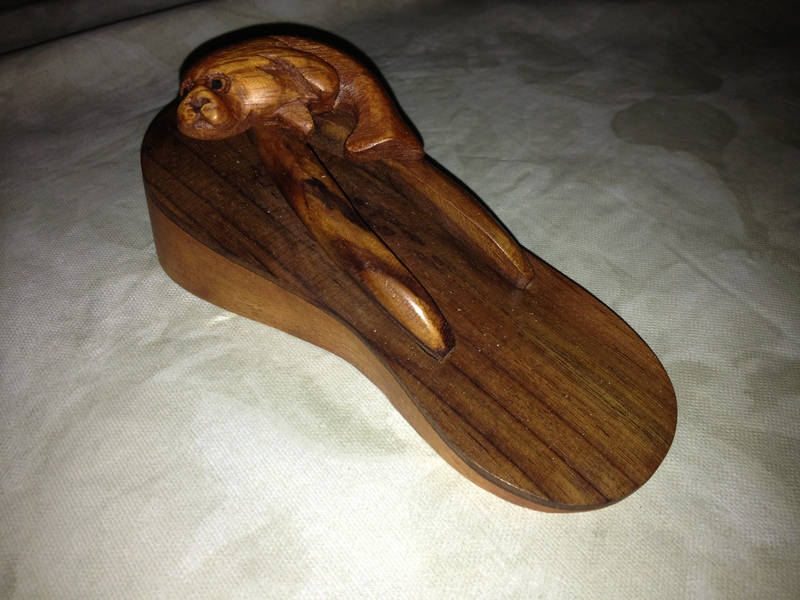 And I bought a couple of wooden flip-flop sandal-shaped manatee doorstops. And E (who is a really cool kid named Eli) and I started goofing around and mispronouncing animal names while standing in crowds, which initially embarrassed the heck out of him, but soon became his preferred MO. “Hey, Glenn, check out that a-LIG-a-tore.” Yuk yuk. So much fun.